DapperLads - *Sale* Boys Blue Striped Seersucker Knicker Set - Knickerbockers - US made Victorian fashion boys knickerbockers sets with genteel nostalgic appeal. This boy's Knickerbocker set couldn't be cuter for the Dapper wee laddie! A charming nod to days of yore. 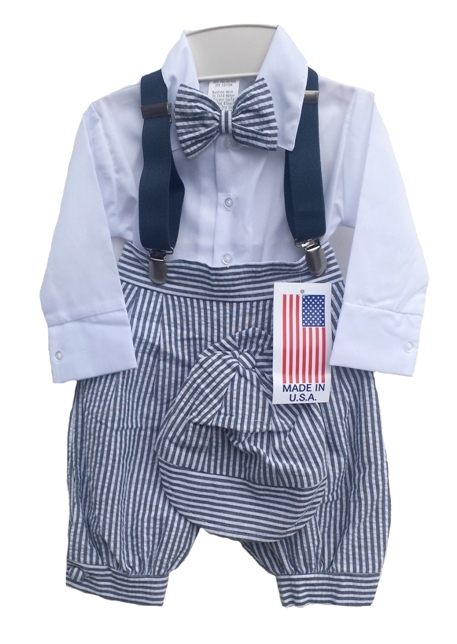 The vintage style knickerbockers are made in an ever-popular blue and white striped seersucker fabric. 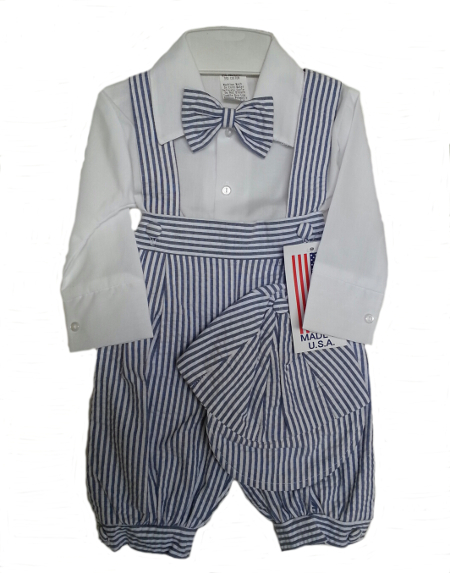 The 4-piece set includes a white shirt, clip-on bow tie, pie cut hat, and the knicker pants. Better brand and US made from Fouger. The shirt is 65% cotton, 35% polyester. The knicker pants are polyester and have an elastic back. The outfit runs fairly true to size, but the hats can be small. The hat has elastic in back. Machine wash gentle. Infant sizes 6 - 24 mo.